Heavy Duty Wide Walking Frame For Bariatric Users. This heavy duty walking frame is a high quality, heavy duty walking frame that is built to last, and more than up to the job! It’s wider than standard walking frames and has been designed specifically with heavier or bariatric users in mind. Providing safe, secure and stable support by means of its height adjustable walking frame, and comfort and grip via the moulded handles. 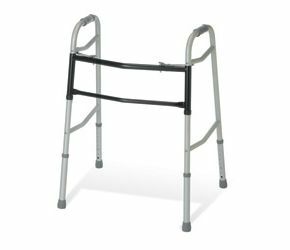 This heavy duty zimmer frame can be folded easily when not in use, making it very easy to transport or store. Constructed with more durable components for increased comfort and stability, you’ll find that this walker more than up to the task! A purchase that will last and last, while supporting an independent lifestyle.